How do you keep your threads? After joining the Crazy Quilt Journal project, I have decided I need some new sewing pretties. In my embroidery, I use a lot of silk thread -- so it seems a new silk thread wallet is needed. These little wallets or cases store your silk thread while you are working and keep them in a clean, snag-free and easy to access manner. In my typical fashion, I haven't really thought this through. I do know that I want to have rings to keep the clipped skeins sorted, and I do need pockets for unused skeins. So, flying by the seat of my pants, I put together an 8 x 8 inch crazy quilt square in french blues, creams and golds, to begin constructing the outer cover. (Sorry, the picture below was taken inside -- and household lights don't lend themselves to good color translation). I will keep you posted as the piece progresses! Starting a new blog is similar to starting a new life! It's fun and full of promise! One of the things I will be using this blog for is to post my progress on the CQJP14 Challenge (Crazy Quilting Journal Project 2014). 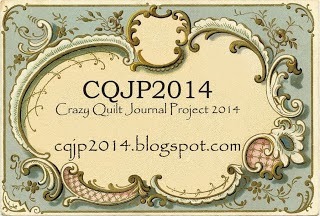 You can sign up here - www.cqjp.2014.blogspot.com. A busy bee at stitching and catering to the every whim of my siamese cat (a.k.a The Emperor) and keeping a dizzy fuzzy-headed poodle out of trouble....who wouldn't need stitch therapy!